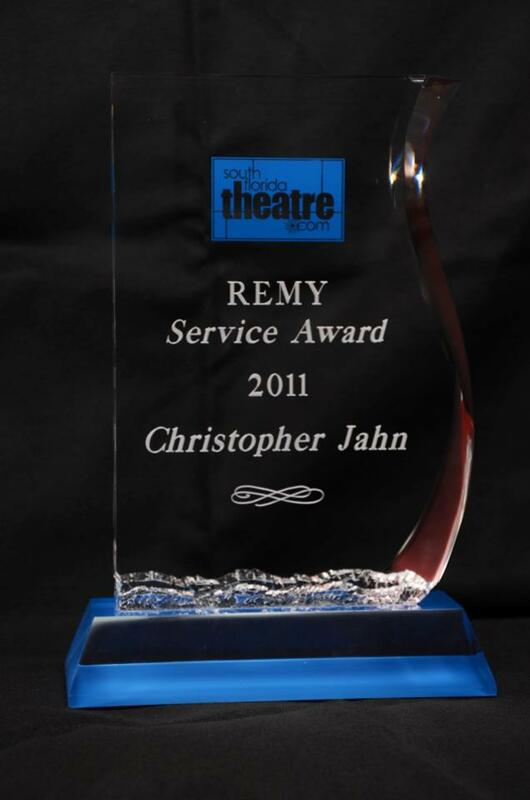 The South Florida Theatre League’s Remy awards, named in honor of Remberto Cabrera, the former Miami-Dade County Department of Cultural Affairs’ Senior Cultural Administrator and Chief of Cultural Development, are given annually for Outstanding Service, and for Pioneering in South Florida regional theatre. This year the League has announced that the number of Remy Awards to be presented will increase from six to eight. (Last year, in honor of the League’s 20th anniversary, the number of awards given was increased from two to six. )The two added categories will once again honor those members of the South Florida theatrical community who are not usually recognized by more traditional artistic awards. The Remy Awards will be handed out at the League’s annual holiday celebration on December 1st at Stache in Ft. Lauderdale. Along with the Service and Pioneer Awards, Remys will be presented for Outstanding Theatre Company Board Member, Outstanding Contributor to Community Theatre, Outstanding Contributor to Children’s Theatre, and Outstanding Behind the Scenes Theatre Professional. The two newest awards to be presented will be the Civic Arts Leadership Award, and the Jay Harris Arts Leadership Award. Theatres and theatre producers were asked to nominate individuals they felt were deserving of recognition, and a Theatre League committee was tasked with choosing the winners. Paul Tei is a playwright, actor, director, designer, and the founder of Mad Cat Theatre Company. As he has stated, “To be safe and create art is a lie. There should be no separation from the art and the artist as well as the action on stage and the spectator. Theatre is a dialogue of deconstruction and within its limitlessness lie the key to a wide spectrum of illuminations.” Under his leadership, Mad Cat has earned a reputation for exceptional and unique theatre, and has received countless awards (in every year of the company’s existence) and innumerable accolades. He has directed almost every one of Mad Cat’s productions; he wrote or co-wrote many plays for the company; he added design elements to all; and even acted in a few. He has also directed in New York, San Francisco, Los Angeles, Nevada, New Hampshire, Vermont, Manchester, U.K. and the Edinburgh Fringe Festival in Scotland where he has always spread the word about Mad Cat Theatre Company and South Florida theatre scene. He has guest directed at many other South Florida theatre companies, including Mosaic Theatre, The Naked Stage, GableStage, and City Theatre. His theatre acting credits in South Florida (with the most recent being in MTC’s Hedda Gabbler) are numerous; he has received 5 acting Carbonell awards. As a member of SAG/AFTRA Paul has appeared in a number of television shows including: American Horror Story, Franklin & Bash, CSI Miami, Disney’s Zeke & Luther. His most notable role was as Barry the money launderer on Burn Notice. Christine Dolen’s contribution to the South Florida Theatre community has been ongoing and constant since she became Miami Herald’s theatre critic in 1979. She has earned the respect of the entire theatrical community, not to mention her peers – 1997, she was a member of the Pulitzer Prize drama jury; in 1999 she was a senior fellow in the National Arts Journalism Program at Columbia University. Chrstine is a member of the American Theatre Critics Association, and she was recently named as one of the top 12 influential theatre critics in the nation. Her reviews, articles, and blog posts are highly anticipated; a pre-show article, a selection as a ‘Pick of the Week’, or even a mention in one of her columns can do wonders for a production. Christine’s reviews are thoughtful and thought-provoking, and have consistently inspired theatres, companies, and performers to strive to meet the standards she expects from them. Her genuine passion and love for theatre is evident in all she does; her dedication to the South Florida Theatrical community is deep – and deeply appreciated. The Civic Arts Leadership Award is a new award given to individuals in public service who have significantly supported the arts. Lois Frankel has been a lifelong patron of the arts. As mayor of West Palm Beach, she recruited the Palm Beach International Photographic Museum, and brought the Ann & Don Brown Theatre, where Dramaworks now performs, to the city. She was a key participant in the revitalization of the downtown district – fueled by cultural events and the addition of performance and exhibition space at the Waterfront Pavilion. Lois Frankel is a strong supporter of the NEA, and as mayor of West Palm Beach, she invested in the arts and sought out opportunities to bring the arts to the city. The 70 new businesses she recruited to downtown added a new vitality to the city, and that vitality is due at least in part to the positive impact of the arts in the area. She is a firm believer in arts education, and has long been a strong supporter of the Bak Middle School of the Arts in Palm Beach County. Kathy and Joe Savarese have played an integral role in the success of the Maltz Jupiter Theatre. Not only have they generously supported the theatre since 2006, but they have also touched the hearts of many, and contributed to the awareness of the magic and charm the theatre brings to the local community. Their commitment has helped shape artistic excellence in our community for generations to come. The Savarese’s love of sharing the arts has inspired them to sponsor a major production each year for the past five years. They consistently support all major events, not only financially, but enthusiastically. Their contributions have created opportunities for the entire region to not only experience the arts live, up close and in person, but to inspire, educate, and entertain. Thanks to their hands-on commitment and financial support the Maltz Jupiter Theatre has achieved recognition for artistic excellence. The Savares’s enthusiasm, passion, and outstanding presence at every event, every show, and every theatre milestone is truly what makes them deserving of this award. GableStage Board of Directors President Steve Weinger is nationally recognized for his successful litigation on behalf of individuals with developmental disabilities. Yet while maintaining his active practice, Mr. Weinger manages to donate significant time to a number of not for profit organizations, including cultural and educational institutions, advocacy groups for the disabled, and non-profit health care providers. His contributions to GableStage include being a driving force behind raising funds to co-produce Tarell Alvin McCreney’s production of Anthony and Cleopatra with The Royal Shakespeare Company in London and The Public Theatre in New York. Although Area Stage had been a well-known theater production company staging professional productions for many years, in 2009 Maria and John Rodaz decided to create an acting conservatory for children and young adults that would carry all the rigors of a professional company. Area Stage’s conservatory program regularly produces student productions of the highest quality. Being part of these productions allows students to learn a high level of professionalism which takes them far when they graduate and leave the program, or branch out to perform outside of AreaStage even while still training there. Area Stage has also instituted a program of scholarships for young actors that do not have the financial means to pay conservatory rates. Alvin E. Entin’s service to community theatre in general, and to Pembroke Pines Theatre of the Performing Arts in particular, has been continuous, persistent, and exemplary. As Chairman of the Board of PPTOPA for 17 years, Alvin has been one of the guiding lights of the company. He forged the agreement with the City of Pembroke Pines which enabled PPTOPA to maintain a healthy financial outlook, and remains the on the Liaison Committee to the City to this day. Alvin chaired the PPTOPA play selection committee from the beginning; he has been the company’s principal fundraiser, marketer, and legal counsel. He is also the face of PPTOPA, maintaining the company’s ticket booth at all productions. Alvin has served as an actor, assistant director and/or director, as well as artistic consultant on numerous PPTOPA productions. His high standards are reflected in the company’s productions, which are judged by critics and professionals in the area to be far beyond the normal perception of community theatre. Gene Seyffer has been a behind the scenes man at Actors’ Playhouse nearly 20 years. Though he has designed sets here and there when called upon, his primary focus has been as Technical Director (which includes overseeing the scene shop) – making sure production design elements are linked together and built just right. He and his team of behind the scenes builders and technical personal at the theatre and in the shop constantly work under extreme pressure and deadlines. Some of Gene’s rewarding technical challenges have included August, Osage County, Miss Saigon, 1776, and Les Miserables. The job of a technical director can be a thankless one, and mostly unknown and unappreciated by the general public, but all who work in theatre know this job is critical to making a production work. Gene holds a MFA in Theatrical Design and Production from Northwestern University. The South Florida Theatre League’s Annual Holiday Party promises to be an exciting event, as the Silver Palm Awards will also be presented that evening. The party will take place at STACHE at 109 South West Second Avenue in Fort Lauderdale, on Monday, December 1st at 7:30 pm. Admission is $25 for non-Theatre League members; there is no charge for League members in good standing. Outstanding Board Member – Stevn M. Weinger, Esq. 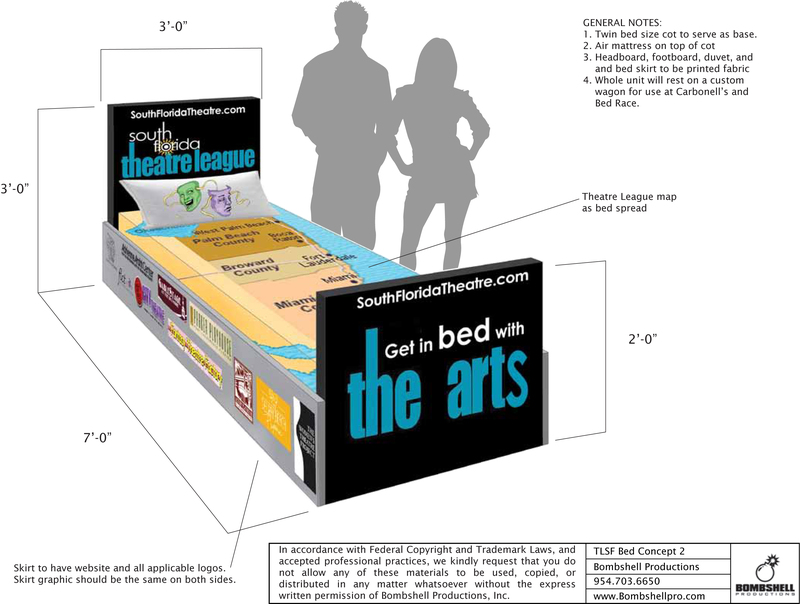 The South Florida Theatre League is building a bed! Yes, a bed. 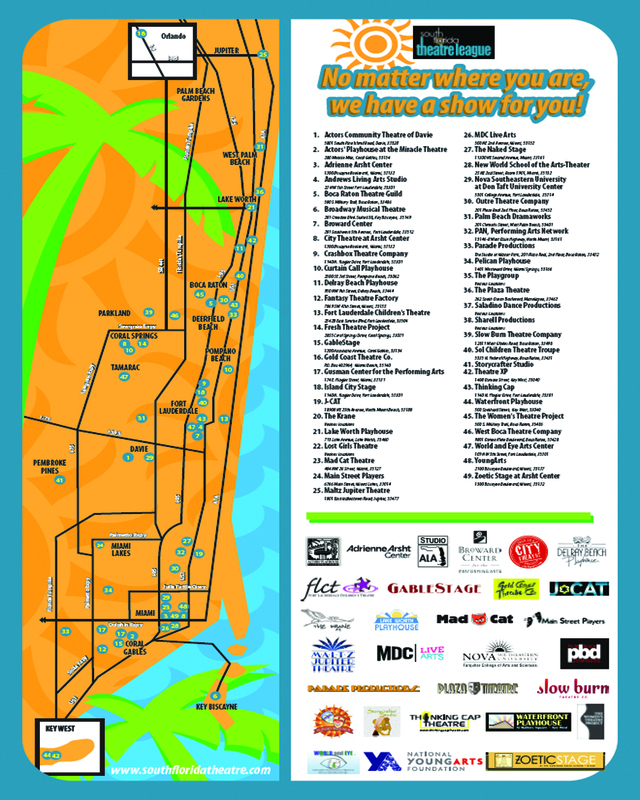 Its cover will be a map listing all South Florida theatres; its bed skirt will contain the logos of the League’s member theatres; its head board will read Get in Bed with the Arts; and its footboard will feature the South Florida Theatre League logo and website address. The goal of the League’s Get in Bed with the Arts campaign, which will run in conjunction with WLRN’s Summer Theatre Fest program, is to raise awareness of the theatrical arts in the South Florida community. The bed will make its debut at the 37th annual Carbonell Awards ceremony on April 1st at the Broward Center for the Arts, and will lead the way to the South Florida Theatre League sponsored after party/celebration; its final appearance will be as a participant in the annual Coconut Grove Bed Race on Labor Day weekend. The bed will ‘visit’ League member theatres during Theatre Fest (June 1st through August 31st) on Thursday evenings (performance days only). Theatre patrons will be invited to participate in the fun – doing interviews, or having their photos taken on or next to the bed. The interviews and photos will be posted on the South Florida Theatre League’s website (www.southfloridatheatre.com/). The bed was designed, built, and generously subsidized by Fort Lauderdale’s Bombshell Productions. TheatreMania is also a sponsor. A complete list of participating theatres, their productions, and run dates will be announced in the near future. The South Florida Theatre League is an alliance of theatrical organizations and professionals dedicated to nurturing, promoting, and advocating for the growth and prestige of the South Florida theatre industry.